Yesterday, my co-coworker Pam sent me a message with a photo on Facebook about something she learned during a carriage ride in Natchez Mississippi. Riding past the cemetery Pam heard about Tripod, a three-legged cat that was befriended by Natchez city workers. 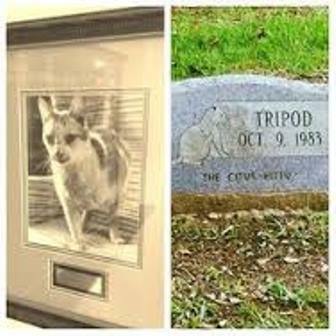 She included a photo of the Tripod’s Headstone for me and I thanked her of course and messaged back, “I’ll add Tripod to my list of names of leg amputees.” The list includes the famous, infamous, fictional, factual, legends, dogs, dolphins (Winter’s dorsal fin), horses, cows, and now my first cat. Anyone with a three-legged pet should visit tripawds. There are more than 6,000 animal lovers registered on the site who have pets with less than four paws. 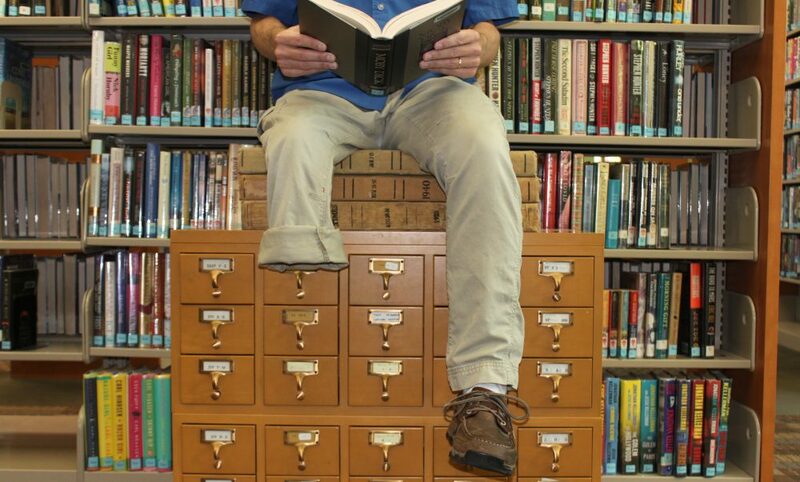 Including Tripod, I’ve got nine legs to add to the list this week, which is the one year anniversary of my blog. On Friday, my sister-in-law Kim forwarded a link for me to check out on Facebook. A 600 pound calf had two hind legs amputated due to frostbite. 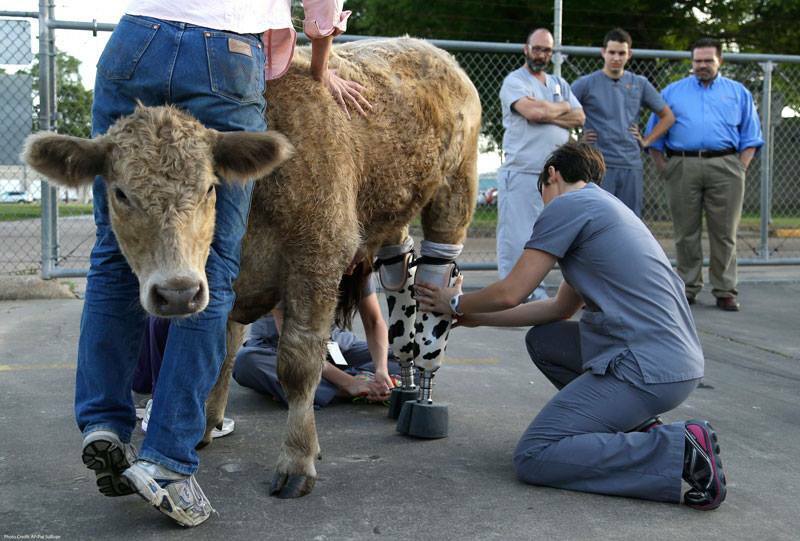 The English Charolais calf was recently fitted with two “high-tech” prostheses in Houston, Texas. Hero’s the only double amputee calf with two prostheses in the United States. I read a fantastic kid’s book on Thursday morning. 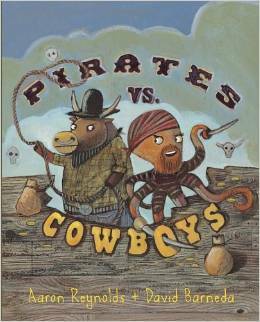 Pirates vs. Cowboys, is written by Aaron Reynolds and illustrated by David Barneda. It’s a story about feuding pirates who go over land to bury their treasure. They run into a motley group of cowboys. But these are no ordinary human pirates and cowboys. Burnt Beard is an octopus, accompanied by an armada of sea creatures. Black Bob McKraw is a steer, with a nose ring, and he’s got a mixed up gang of barnyard animals and desert characters, including a prickly cactus in a pot. What makes the story effective is that it’s not an archetype peg-leg character. Pegleg Highnoon is not the villain, though he is an alligator. He’s not just any old gator, but he’s the world’s only pirate cowboy. Pegleg Highnoon’s a peacekeeper, moderator, and the closest thing there is to a lawman in Old Cheyenne. I really enjoyed reading about Pegleg, as I discovered something of his character in me. I don’t want to be typecast as the angry amputee and I’m usually looking to avoid conflict by seeking common ground. Stop by your local library or bookstore and check it out. I have been following the court appearances of “the fastest man on no legs” in South Africa. Oscar Pistorius is still on trial for shooting and killing his girlfriend Reeva Steenkamp on Valentine’s Day 2013. The double amputee competed in the Summer Olympics in 2012. 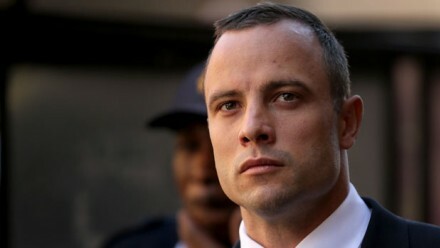 On Tuesday morning, the trial stopped because the judge ordered Pistorius to undergo psychiatric testing to find out whether he was “criminally responsible” on the night he shot and killed his girlfriend. Pistorius’ infamy has kept him out of prison. Most people go to jail while they wait for a psyche ward bed to open up, but he will remain on the outside. Pistorius will also be an outpatient while he undergoes evaluation. Prior to his arrest, I had never been so proud of an amputee’s actions as I was in those moments watching Pistorius pistoning around the track on his Cheetahs. I watched double below-knee amputee Amy Purdy dance for the first time Tuesday night. I was skeptical about her ability to compete against two good legs. I will say for a dancer who doesn’t move her ankles, is on her toes, and in swim prostheses, she was outstanding! That night Amy stepped on the dance floor. I was riveted, mesmerized, and in awe of her human and hardware synchronicity. Amy didn’t win this season’s “Dancing with the Stars” on ABC. Meryl and her partner, even to my super amateur eyes, were better. Many people I knew said the couple deserved to win, but I think that was based on Amy’s story, rather than her dancing, which was phenomenal and nearly flawless. After contracting Bacterial Meningitis at 19, both her legs were amputated. She also received a Kidney from her father. We humans are suckers for an inspirational story, especially one so perfectly packaged for network TV. There’s no doubt Amy is confident, athletic, and an attractive person. It’s interesting that the network TV viewer that fell in love with the dancer may not know Amy the snowboarder, skateboarder, and self-proclaimed “Fembot” blogger. I’m intrigued by the edge-y, experimental, provocative, creative, and risk-taking Amy I discovered in a risqué photograph taken by Motley Crue Bassist Nikki Sixx. She’s wearing a pair of custom-made ice pick legs.